His show on Pogo TV channel has been running regularly since 2008, currently watched by around 60 million people - mostly children - every month. Some 200,000-300,000 copies featuring him sell every year. His movies, three so far, have raked in Rs 14 crore at the box office - modest earnings, perhaps, but commendable in a country where locally made animation films hardly draw audiences. His friends and he are branded on all kinds of children-related merchandise - 100 different products at last count with 3,000 different designs. With his impish appearance - big, saucer-like eyes and trademark tuft rising from the back of his head - and sartorial simplicity - bare torso and long dhoti - Chhota Bheem, nine-year-old do-gooder in the kingdom of Dholakpur, created and marketed by the Hyderabad-based Green Gold Animation, seems an unlikely candidate to match the popularity of the likes of Mickey Mouse, Spiderman or Doraemon. 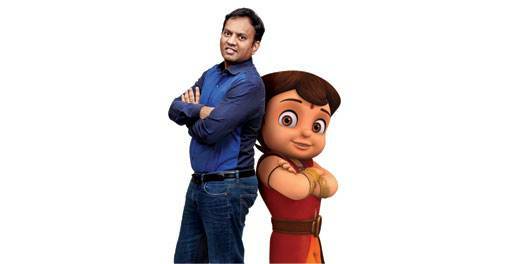 Rajiv Chilaka, 42, Founder and CEO of Green Gold and the man who dreamt up Chhota Bheem, knows his precise viewer profile. "Children between four and 14 watch Chhota Bheem, even some two-year-olds do, though the core group is between the ages four and nine," he says. He also knows what this audience is looking for. "You have to think like a child to understand children," he says. "Children want interesting stories told in uncomplicated fashion. They want the thrill of anticipation along with pleasant surprises." He still remembers the precise date on which the character occurred to him. "It was September 18, 2003 and I was reading an Amar Chitra Katha comic book," he says. "The last page had a listing of other titles in the series. One of these was Bheem, the Bheem of the Mahabharata, the second of the five Pandava brothers. Bheem had been my favourite character since childhood - he was very strong, fond of good food, plain speaking and uncomplicated. He was a mythological character very different from those usually featured in comic books and animation films, such as Rama, Krishna or Arjuna. Suddenly, the character of Chhota Bheem, distinct from the original Bheem but sharing many of his attributes, popped into my head." 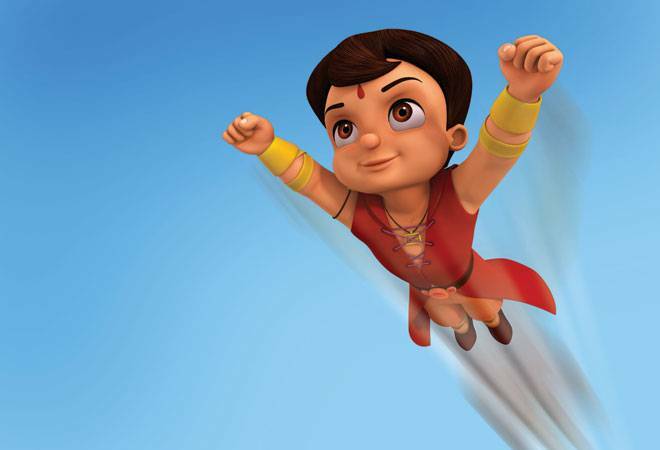 It took nearly five years to translate the concept into reality - develop the character fully, prepare a pilot and get it approved, set marketing strategies in motion - but finally the first episode of the animated Chhota Bheem show was aired on April 6, 2008. The roles of Chhota Bheem's friends - Raju, Chutki, Kalia, Dholu, Bholu and Jaggu - were refined as the show progressed, often in response to audience needs. Take, for instance, Chutki. "Initially the focus was largely on Chhota Bheem, but as we went forward, we realised the need for a character with which young girls could identify," says Chilaka. "This led to defining Chutki's role more sharply, where she would often come up with solutions to problems that Chhota Bheem would then execute." The character of Kalia, who at times competes fiercely with Chhota Bheem, also had to be carefully modulated. "We did not want him to be seen as a negative character," adds Chilaka. "The focus was on building the comedy element around Kalia and his partners Dholu and Bholu, while presenting them as active participants in team efforts towards problem resolution." Following the TV shows, the first comic book featuring Chhota Bheem came out in 2009. The merchandising of the characters began the same year; the first feature film on Chhota Bheem hit Indian theatres in 2012. In February last year, with a modest investment of Rs 1.5 crore, Green Gold itself began manufacturing Chhota Bheem soft toys. Its narrative, too, has evolved from episodes where Chhota Bheem's enormous strength makes all the difference, to those where the team intelligently resolves problems. So has the company evolved, expanding from 25 employees in 2007 to 400 at present, with 2015/16 total revenues at Rs 57.1 crore (that of Green Gold Animation and Green Gold Licensing & Merchandising taken together), up from Rs 50.72 crore the previous year. "We plough all our resources back into the company," says Chilaka. Brand gurus swear by Chhota Bheem. "He is a very Indian character," says leading brand consultant Harish Bijoor. "The makers have brought together Indianness, mythology, food, and a child's view of the world in a great combination." Bheema's fondness for food has been transmuted into Chhota Bheem's love of laddoos, which makes every food and beverage brand want to associate itself with the show. Piyush Kumar Sinha, Professor of Marketing at IIM-Ahmedabad, feels similarly. "Though the name of the show has a connection with mythology, its presentation in a contemporary environment has ensured that children relate to it," he says. Saumitra Prasad, Chief Marketing Officer at Kokuyo Camlin, a leading name in the stationery business, confirms that the brand does help sales. "We've used Chhota Bheem branding on some of our products such as pencils and crayons for three years in a row now, and we've found sales in these categories growing by 15-20 per cent, against the industry average of 9 per cent," he says. "Unlike global brands, Bheem has appeal in smaller cities and towns as well." "Each Super Bheem episode in 3D animation costs 40 per cent more than a 2D version, but we also expect 50 per cent higher income with a 3D show "
"It's a very strong franchise for Pogo and sits at the very top in terms of children's favourites," says Deepa Sridhar, Director (Communications), South Asia, Turner International India, which owns Pogo TV. Among peers, however, the assessment is less gushing. "There was lack of local competition when Chhota Bheem was launched," says Ram Mohan, a veteran of the Indian animation industry and Chairperson, Graphiti Multimedia. "It was a product that a certain age group could immediately relate to. Most importantly, it was backed by powerful channels like Cartoon Network and Pogo." When Chhota Bheem started, shows such as Doraemon, Pokemon and Ben 10 ruled the roost, with Tenali Raman, begun in 2001 and produced by the Kerala-based Toons, perhaps the only other Indian-origin show on air. With foreign shows, however popular, Indian audiences always felt a cultural gap, which Chhota Bheem effortlessly bridged. The current scenario is very different, with a number of wholly Indian animation shows competing for children's eyeballs. "Chhota Bheem continued to do well in 2015," says the Indian Media and Entertainment Industry Report, 2016, brought out jointly by KPMG and FICCI. But it also brackets another show, Motu Patlu, created by Maya Digital Studios (a subsidiery of Cosmos Entertainment Pte) and aired on Nickelodeon channel since October 2012, along with Chhota Bheem as equally popular. Indeed, in the popularity rating of TV shows for children from January to July 2016, by Broadcast Audience Research Council (BARC) India, Motu Patlu ranked No. 2, ahead of Chhota Bheem, at No. 3. (The No. 1 spot, which Chhota Bheem once unquestioningly occupied, has gone back to Doraemon.) Other Indian shows in the Top 10 include Roll No 21, Mighty Raju, Shiva and Haddi Mera Buddy. "New shows like Shiva, Bandbudh aur Budbak and Pyaar Mohabbat Happy Lucky have been launched in 2015," the KPMG-FICCI report notes, of which Shiva is already at No. 8 in the ratings. (See Top 10 Kids' Programmes). Ram Mohan's Graphiti is today arguably the only Indian studio with a children's show offering folktales and folk music called 'Krish, Trish and Baltiboy', which has been on air on Pogo and Cartoon Network since 2010. Chilaka, recognising the need for renewed effort, launched Super Bheem on May 1 - Chhota Bheem's birthday - this year, where Bheem and his companions are no longer confined to Dholakpur but travel the universe riding a dragon, supporting good and battling evil. Super Bheem, which includes use of 3D animation, has begun as a series of short films but will be a regular TV show from next year. "After a successful near-decade on Indian TV, we felt it was time for a change in the narrative," says Chilaka. "We wanted to give a better look and feel to the character, and enhance its appeal with 3D animation." Some of the competition, such as Motu Patlu, is already in 3D animation. It will raise costs but Chilaka believes it is a necessity. "Each Super Bheem episode, which uses 3D animation or computer graphics interface, costs 40 per cent more than it would have done in a 2D version, but we also expect 50 per cent higher income with a 3D animation show." Chilaka, currently in the US, hopes Green Gold will be able to leverage its understanding of the young audiences and come up with suitable equivalents of Super Bheem for markets abroad. In September, he will open a studio in Los Angeles with a six-member team. "We are investing a million dollars in it," he says. "The focus is to develop content for an international audience in the same age group as Chhota Bheem." Marketing research is on to decide on what will work, after which Green Gold will look for local partners in foreign markets to beam the programme on local channels. Later, Chilaka even wants to target theatres abroad with full-length films. He is also thinking of Chhota Bheem theme parks in India. He knows, too, that such plans will require raising fresh capital, either through an IPO or private equity investment. "Our dream is to be another Disney in the global market," he says.